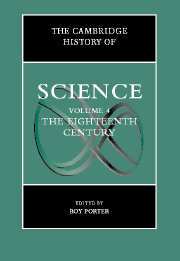 This volume offers to general and specialist readers alike the fullest and most complete survey of the development of science in the eighteenth century, exploring the implications of the ‘scientific revolution’ of the previous century and the major new growth-points, particularly in the experimental sciences. It is designed to be read as both a narrative and an interpretation, and also used as a work of reference. While prime attention is paid to western science, space is also given to science in traditional cultures and colonial science. The coverage strikes a balance between analysis of the cognitive dimension of science itself and interpretation of its wider social, economic and cultural significance. The contributors, world leaders in their respective specialities, engage with current historiographical and methodological controversies and strike out on positions of their own. 1. Introduction Roy Porter; Part I. Science in Society: 2. The legacy of the ‘scientific revolution’: Science and the enlightenment Peter Hans Reill; 3. Science, the universities, and other public spaces: teaching science Lawrence Brockliss; 4. Scientific institutions and the organization of science James McClellan III; 5. Science and government Robert Fox; 6. Exploring natural knowledge: science and the popular Mary Fissell and Roger Cooter; 7. The image of the man of science Steven Shapin; 8. The philosopher’s beard: women and gender in science Londa Schiebinger; 9. The prosopography of science William Clark; Part II. Disciplines: 10. Classifying the sciences Richard Yeo; 11. The philosophy of science Robert Iliffe; 12. Ideas of nature: natural philosophy John Gascoigne; 13. Mathematics Craig Fraser; 14. Astronomy and cosmology Curtis Wilson; 15. Mechanics and experimental physics Rod Home; 16. Chemistry Jan Golinski; 17. The life sciences Shirley A. Roe; 18. The earth sciences Rhoda Rappaport; 19. The human sciences Richard Olson; 20. The medical sciences Thomas H. Broman; 21. Marginalized practices Patricia Fara; Part III. Special Themes: 22. Scientific instruments and their makers G. L’E. Turner; 23. Print and public science Adrian Johns; 24. Scientific illustration in the eighteenth century Brian Ford; 25. Science, art and the representation of the natural world Charlotte Klonk; 26. Science and voyages of discovery Rob Iliffe; Part IV. Non-Western Traditions: 27. Islam Emilie Savage-Smith; 28. India Deepak Kumar; 29. China Frank Dikötter; 30. Japan Shigeru Nakayama; 31. Latin America: from Baroque to Modern Colonial science Jorge Cañizares Esguerra; Part V. Ramifications and Impacts: 32. Science and religion John Hedley Brooke; 33. Science, culture and the imagination: enlightenment configurations George S. Rousseau; 34. Science, philosophy, and the mind Paul Wood; 35. Global pillage: science, commerce and Empire Larry Stewart; 36. Technological and industrial change: a comparative essay Ian Inkster; Notes on contributors.